Thermal stress concerns arise in many engineering situations, from aerospace structures to nuclear fuel rods to concrete highway slabs on a hot summer day. Having the tools to understand and alleviate these potential stresses is key for engineers in effectively executing a wide range of modern design tasks. Written for students and working engineers, this book features numerous sample problems demonstrating concepts at work. In addition, appendices include important SI units, relevant material properties, and mathematical functions such as Bessel and Kelvin functions, as well as characteristics of matrices and determinants required for designing plates and shells. 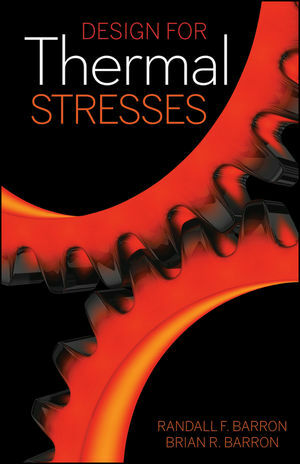 Suitable as either a working reference or an upper-level academic text, Design for Thermal Stresses gives students and professional engineers the information they need to meet today's thermal stress design challenges. Randall F. Barron is Professor Emeritus of Mechanical Engineering at Louisiana Tech University in Ruston, Louisiana. He received his BS in mechanical engineering from Louisiana Tech University, and his MS and PhD in mechanical engineering from The Ohio State University in Columbus, Ohio. He is the author of three college-level textbooks: Cryogenic Systems, Cryogenic Heat Transfer, and Industrial Noise Control and Acoustics. Brian R. Barron is a lecturer in mathematics and statistics at Louisiana Tech University in Ruston, Louisiana. He received his BS degree in mathematics education from Louisiana Tech University, his MDiv from St. Paul School of Theology in Kansas City, Missouri, and his MS in mathematics and PhD in computational analysis and modeling from Louisiana Tech University.